Hard-boil the eggs and allow them to cool; separate the yolks from the whites. Mash the yolks with softened butter. Stir in the ground walnuts, dill, salt and adzhika.Turn out onto a serving plate and surround with chopped egg whites. Serve at cool room temperature. For a creamier salad, do not separate the hard-boiled eggs. 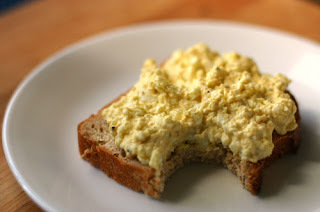 Mash the eggs with 3 tablespoons of softened butter, ground walnuts, dill, 2 tablespoons each of minced cilantro and scallion (white part only) and 1/8 teaspoon of salt. Sprinkle 2 tablespoons of pomegranate seeds on top of the salad for garnish.